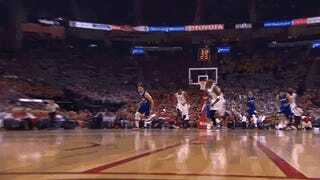 The Los Angeles Clippers are wounded—literally!—and in trouble. Chris Paul’s out for at least five more weeks with an injured thumb; Blake Griffin only just returned from a knee injury that kept him out of 18 games. They’ve lost three of four, and to some real dogs: the Wolves, Nuggets, and 76ers. The Warriors, Spurs, and Rockets have left them behind at the top of the West; the Jazz, Thunder, and Grizzlies are gaining on them from below. More than home-court advantage in the first round of the playoffs may be at stake for them over the next month-plus. Their core—Paul, Griffin, DeAndre Jordan—is very expensive, well into its prime, and has never advanced beyond the second round of the playoffs. Both Paul and Griffin will be free agents after next season. If these Clippers are ever to make a serious run at a championship, they do not have much time left to do it, and they do not have much ground to give in the pursuit. They need help. If this sounds like a set of circumstances that would make them good trade partners for the Knicks, who reportedly are looking to unload the still very good but aging and unhappy Carmelo Anthony, it probably is! You can imagine the line of thinking: Melo, whose no-trade clause gives him veto power over any proposed deal, gets the revitalizing jolt of playing meaningful games for a star-studded playoff team; the Clippers get, well, Melo, which is still a self-evidently appealing prospect even at this point in his career; and the Knicks, dealing from a position of relative strength, capitalizing on the Clippers’ fairly desperate need, get to target a player they’ve long had their eye on: Austin Rivers. Could Carmelo Anthony join Chris Paul, Blake Griffin and DeAndre Jordan in Los Angeles? With the Knicks known to think very favorably of 24-year-old Clippers guard Austin Rivers (career-high 11.9 points per game this season), and with various combinations of trade scenarios known to include other players like veteran shooting guard J.J. Redick (who will be a free agent this summer) and super sixth man Jamal Crawford(who signed a three-year, $42 million deal last summer), it seems clear that the Knicks’ interest level in parting ways with Anthony is growing by the day. 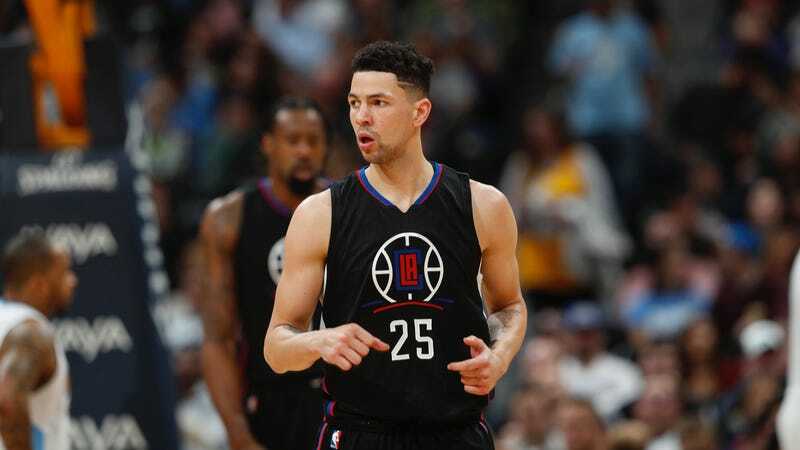 Yeah, yeah, go ahead and point out that if the Clippers include J.J. Redick (and/or Jamal Crawford) in a trade, it won’t really be The Austin Rivers Trade, and there might even be some ways to argue that it’d be a smart or at least defensible move on the part of the Knicks. And while you’re at it, you can also point out that that hypothetical trade might well be suicidal for the Clippers, too. I’m just going to sit over here and laugh my head off for the rest of eternity at that first clause up there, even if a trade never happens. Maybe even especially if a trade never happens. Just knowing the Knicks “think very favorably” of Austin Rivers has made my entire week. Here is a fun .GIF of Austin Rivers, a 24-year-old shooting guard of whom the Knicks think very favorably. 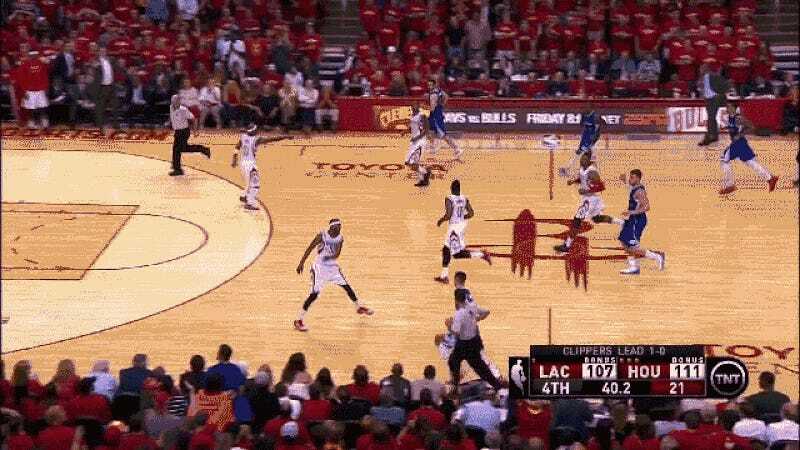 Literally the best play Austin Rivers has ever made on a basketball court. Here’s another one from a completely different game like two nights later. It was their very next game! Godspeed, New York Knickerbockers. Phil’s gonna trade Melo for a bucket of toenails with Ron Harper’s face drawn on it in crayon.